As a Buckeye fan, let me offer my congratulations on the Harbaugh hire! It really is great news. It makes Michigan football immediately relevant, boosts the Big Ten’s profile, and gives Buckeye fans like me a team – and a rival – that’s worthy of respect. When Michigan is strong, everyone wins: Michigan, Ohio State, the Big Ten; college football. Sure, watching you guys suffer a seemingly never-ending variety of painful humiliations over the last several seasons has been a rare joy. Not to mention the sweet taste of winning 12 of our last 14 games. But the truth is, it’s hard to get excited about The Game when Michigan is so damn mediocre, even downright bad. At least in the 90’s, when you were having your way with John Cooper, the Buckeyes often arrived as one of the nation’s top ranked teams, only to see their season ruined at the hands of a multi-loss Michigan squad. And while those games added to the rivalry’s intensity and mystique, the deeper truth is that they helped mask a trend that became all too clear these last seven years: that Michigan football was in serious, steady decline. To wit: over the last 22 seasons, Michigan’s average record is 8-4 (184-90). They’ve won just four Big Ten titles, and have only two serious national title runs, converting once in 1997. During that same time, Ohio State has averaged ten wins per season (224-54-1), won 11 Big Ten titles, the 2002 national championship, made three national title game appearances, earned a spot in the first College Football Playoff, and finished in the top-five 13 times. The comparison is stark, and leads to an inescapable conclusion; that for more than two decades, Michigan has been a second-tier power. After the debacles known as Rich Rod and Brady, the thought of spending years in the wilderness, maybe never returning to true prominence, had to look not just horrifyingly possible, but feel almost inevitable. One person, and one person only, could save you from this tragic fate: Mr. James Joseph Harbaugh. And wouldn’t you know it, just when you’d reached a nadir of despair, the numbskulls in San Francisco were kind enough to throw you a bone; a huge, meaty, gravy-slathered bone. But do you know the last school the football gods blessed so generously? Why, The Ohio State University, who just happened to have one Urban Francis (Frank really, but Francis sounds better) Meyer III, tanned, rested and ready to work, just as we were staring into our own personal abyss. So what’s that tell you? Well it tells me that Woody and Bo have had enough. It tells me they’ve been busy at work, pulling angelic levers so that our shared corner of the college football universe can once again be in proper alignment. To which we say, welcome back. Markets are lower this morning on overseas weakness. Bonds and MBS are up. House prices rose .76% month-over-month in October (up 4.5%) year-over-year according to Case-Shiller. Prices are back to their Autumn 2004 levels. The prospect of QE has driven risk-free rates lower in Europe, which has lured US companies to issue Euro bonds. The spread between investment grade Euro notes and investment grade dollar notes is currently 211 basis points, an all-time high, and a big increase from 145 bp a year ago. Companies like Apple are issuing billion in euro bonds yielding something like 1.65%. If you wonder why the big S&P 500 companies seem to be doing great, in defiance of what we see around us, here you go. International exposure matters. The local muffler shop cannot borrow at 1.65% while multinationals like Apple can. While the economy is improving, the stock market is painting a non-representative picture of the US economy. Delinquencies ticked up to 6% in November, according to Black Knight Financial Services. Foreclosure starts ticked down to 73,900. Note Black Knight Financial Services (formerly known as LPS or Lending Processor Services) has filed for an IPO. It being Boxing Day in the UK and a Friday for the rest of the world, there is no European markets open and no Asian markets to follow our own. So the US is pretty much dead today, despite being officially open. I posted this mainly to avoid having to despoil the Merry Christmas post with a link to Matthew Yglesias. Merry Christmas to everyone still hanging around ATiM. Here’s a classic Christmas tune from an up and coming talent to help you celebrate. Markets are higher as decent data comes in. Bonds and MBS are down small. Almost all of this week’s data is being released today. Today is a full day, Wed will be a half day, and Friday will be a full day (so far). Third quarter GDP was revised upward to to +5% from +3.9%. Personal Consumption was revised upward from 2.2% to 3.2%. Inflation remained unchanged at +1.4%. Durable Goods orders on the other hand came in weaker than expected, down .7%, after the Street was expecting +3%. New Home Sales fell to 438k from 458k last month. This is the seasonal slow period, so I wouldn’t read too much into it. Personal Income rose .4% in November, while Personal Spending rose .5%. The PCE deflator (the preferred inflation measure for the Fed) was down .2% on a month-over-month basis and up 1.2% on a year-over year basis. The University of Michigan Consumer Sentiment Index ticked down to 93.6 in December. The Richmond Fed Manufacturing Index rose to 7 from 4. The FHFA Home Price Index rose .6% in October after a flat September. On a year over year basis, home prices increased 4.5%. The index is roughly 5% lower than its April 2007 peak. Remember, this index only looks at homes with a conforming mortgage, so it is a narrower sample than Case-Shiller. Cool background on yesterday’s DDOS attack on North Korea. Is it Anonymous? The CIA? China? Ocwen stock got slammed yesterday as they announced a settlement with New York State and its founder stepped down. Ocwen will not be able to purchase any more MSRs without New York State approval. They also were fined $150 million. The stock got rocked for 27% yesterday, and is down 70% for the year.The stock is down another 3 bucks (19%) this morning.. This one may be a value trap, folks. Finally, the MR will be on hiatus for the holidays. Wishing you and yours all the best. This week is for all intents and purposes a two day week. Markets will close early on Christmas Eve and many will take off Friday. The big deluge of data is tomorrow, with GDP, personal income, personal spending and a host of other indicators. The risk-on trade continues this morning, with stocks up small and bonds down a tad. Oil continues to fall. Existing Home Sales fell 6.1% to a seasonally adjusted annual rate of 4.93 million, according to NAR. Housing inventory was tight and bad weather didn’t help things either. The median existing home price was 205,300, which is 5% above November 2013. According to Sentier Research, the median income in the US was $53,700 as of the end of October. 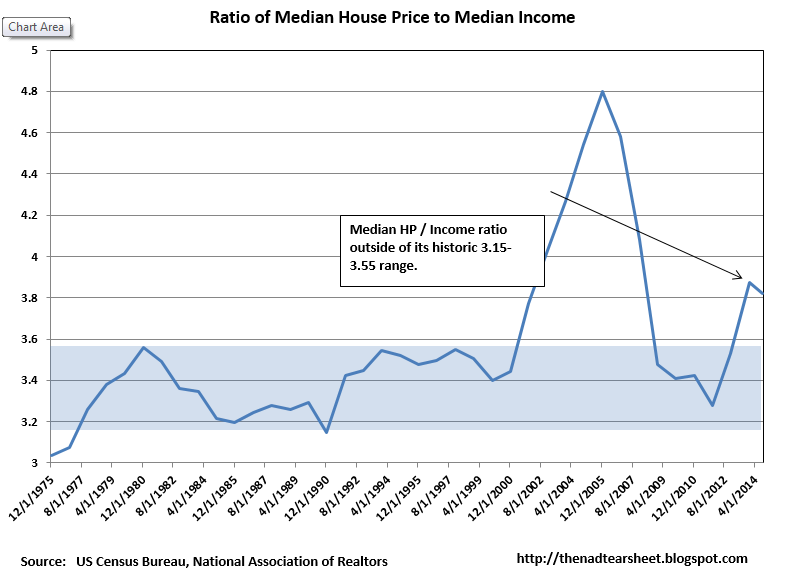 This makes the median home price to median income ratio just over 3.8, which is above its historical range of 3.15x – 3.55x. 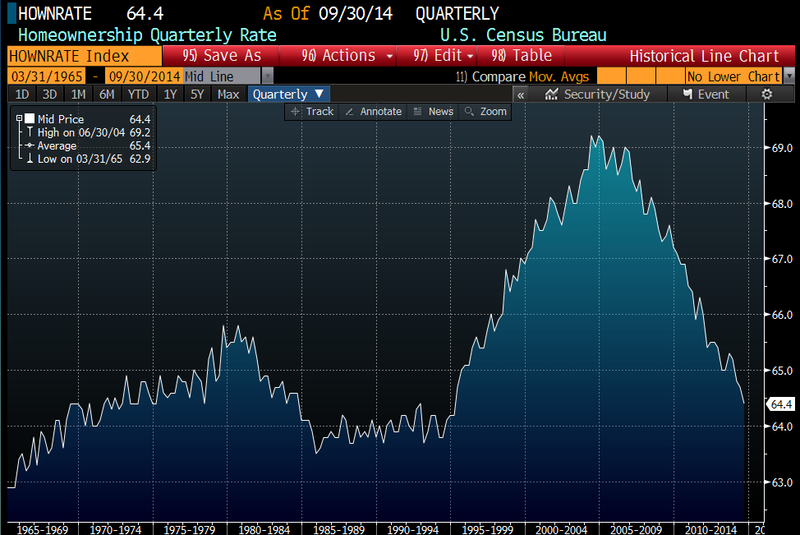 This means home price appreciation is probably going to be hard to come by until wage inflation begins to pick up. The Chicago Fed National Activity Index hit +.73 in November, which is a very strong reading. Production and employment drove the increase. Housing and Consumption remained small headwinds. The strength in the US bond market is likely to continue into 2015 as global bond investors see (relatively) high yields underpinned by a strong dollar. The punch line is that even if the Fed starts hiking rates, global demand for the 10 year bond means that mortgage rates could pretty much stay where they are for the time being. In other words, the Fed could hike rates and we could simply see the yield curve flatten. That is good news for the real estate industry, obviously. One other thing to keep in mind: a flattening yield curve is a classic “tell” that the economy is slowing down, and by all accounts, it looks like the economy is accelerating. This will be another situation where the classic investing playbook isn’t going to help you all that much. In other words, if the Fed starts hiking rates and mortgage rates stay where they are, don’t all of a sudden dump your portfolio and pile into defensives like Proctor and Gamble or General Mills.